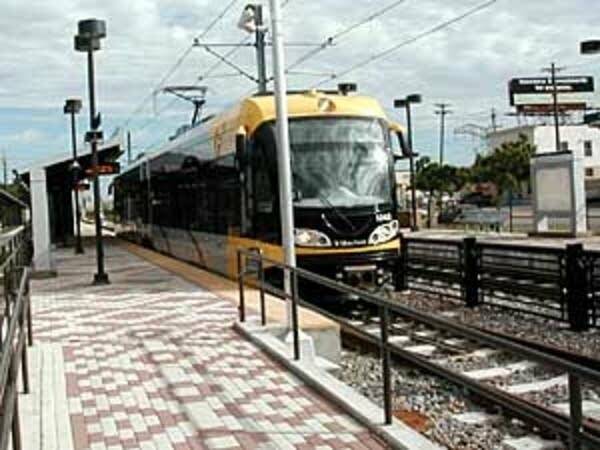 Supporters of the Central Corridor light rail line breathed a sigh of relief this weekend when Gov. Tim Pawlenty and legislative leaders ended their marathon talks with an a deal that includes state funding for construction. Half of the money for the $909-million project is expected to come from the federal government, so $70 million from the state might not seem like a lot. But without it, the rest of the funding was in limbo. Ramsey County Commissioner Jim McDonough said the Federal Transit Administration, or FTA, won't hand over any money until it knows where the local money is coming from. Lawmakers' action yesterday answered that question. 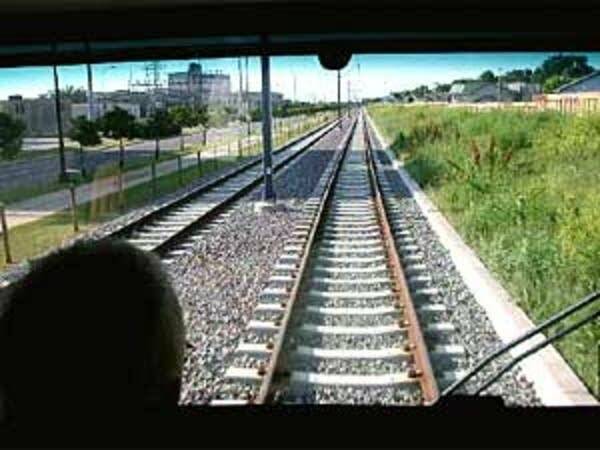 There will be state money, county money, and money from a new transit sales tax that takes effect this summer. "When you have a dedicated funding source, it's so much easier to move your project forward on the financial side of this for the local match because the FTA knows your money is there and it's solid," McDonough said. But the money wasn't so solid last month, after Governor Tim Pawlenty vetoed the $70 million from a bonding bill. Pawlenty said concerns with the project that forced his veto last month have now been satisfied. The funding, for example, also comes with an additional requirement that the state pay no more than 10 percent of the total construction costs. "That's a good thing because the cost of these projects escalate as local officials and people want additional stops," Pawlenty said. "They want different things along the way; the costs escalate and we wanted to make sure the state's exposure was capped and that was achieved in the new bonding bill." 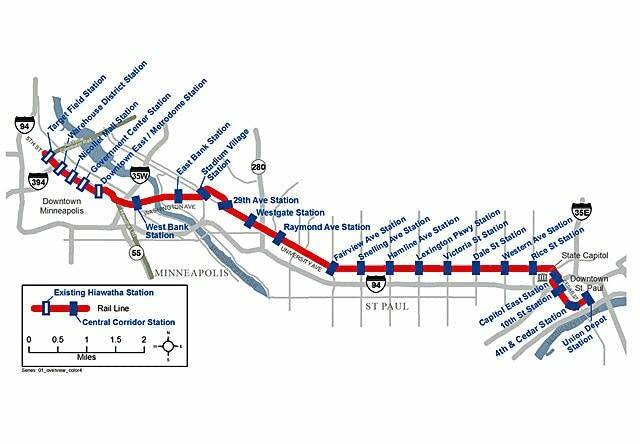 Now with the funding back in place, supporters of the Central Corridor can turn to finalizing the line's route. The University of Minnesota and Metropolitan Council have been squabbling over how best to get the line through campus. The current plan takes tracks down Washington Avenue, while university officials recently suggested a northern route, through Dinkytown. Metropolitan Council Chairman Peter Bell said he doesn't think the Dinkytown route can be done to the federal government's standards, which would put federal funding at risk. And Bell said the council will probably put the university issue to rest this week. Council members will either vote to stick with the current Washington Avenue route or go with Dinkytown. Either way, it should let the entire project move forward. "I think the residents of the seven-county area can look forward to the certainty of an expanded transit system, with a line that will provide a strong degree of service," Bell said. In a statement today, university President Robert Bruininks praised the new state funding for the Central Corridor and says the school is committed to finding a workable solution. Bell said the Met Council plans to submit its request for $450 million in federal money this September. And while the state funding for the Central Corridor was getting most of the attention this weekend, lawmakers also passed a lesser-noticed measure. The builders of both Central Corridor and the Northstar commuter rail line will now be able to buy things like train cars without paying state sales tax. That exemption is worth about $9 million and will take effect in 2010.